Steven Greenhouse, who generally covers labor issues for the NYT, has a blog post about a new paper on the current “jobless and wageless recovery.” The authors (Andrew Sum, Ishwar Khatiwada, Joseph McLaughlin, and Sheila Palma, from the Center for Labor Market Studies at Northeastern University) present the most comprehensive statistics I’ve seen on how capital has recovered in lieu of labor. 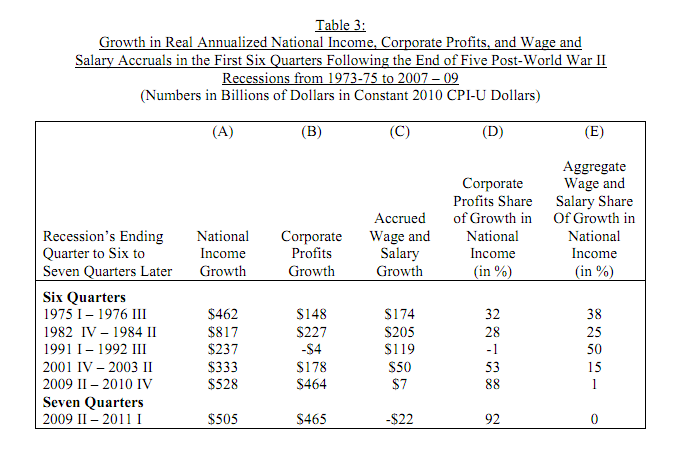 The chart below, for example, shows that 92% of national income growth has gone to corporate profits in the current recovery. The same dynamics that led us into the crisis are leading us forward in stagnation. There is no reason to expect a vibrant recovery in consumption if all gains in output and productivity are going to corporations, while government money is running to the sidelines. The authors don’t delve into what’s causing this dynamic, but it should be obvious to anyone who has followed American political economy in the last 3 decades. Corporations simply have too much power in economic and political spheres. American workers and voters are no longer organized to fight this power. I originally saw the election of 2008 as a correction from the usual feedback loop, and it certainly has been in some ways, but certainly not to the extent that is needed. Capitalism’s defining quality is evident in its name- capital, not labor, nature, or morals, is put above all else. This preeminence of capital has ramifications for how we produce, consume, earn, save, and tally it all up; I argue that it causes problems in each of these facets of our economic life. Often, people confuse capitalism with markets (free ones in particular). Instead, I think capitalism has a few distinctive consequences: 1) surplus is distributed by those who own, not those who work and make; 2) more consumption is always better; and 3) anything “outside” the economy, like the environment, may as well not exist. Capital is relevant to these features because it means that the production process can be owned, and thus the fruits of it can be immediately taken from the hands that produce it. As a corollary, this means that to profit, those who own capital must sell as much as possible, some of which is indeed bought back by those who make the goods. And finally, capital seeks its return without any regard to destruction that it doesn’t have to pay for, like ozone depletion or disappearing wetlands. As long as capital remains preeminent, we cannot remake capitalism. Instead, we need to gradually remake economic structures to chip away at capital’s power. Giving workers stock ownership is one small step, but giving workers complete control over their enterprise is a more radical fruitful step. It would mean that production and consumption would be more tightly linked, as the amount one consumes would be more in line with what one produces. Lavish consumption would not disappear entirely, but would be made scarce. Remeasuring economic value to include environmental externalities is another small step, but forcing these externalities into pricing through democratically-decided taxes is a larger and more fruitful step (and I guarantee, a worker-run Chamber would fight it a lot less). These steps must be supported by increased class consciousness through education. The value of worker ownership and environmental stewardship are obvious to their beneficiaries; demonstrating that capital’s dominance stands in the way of these benefits is critical. A class-conscious society will support economic structures that value labor and value nature, not just profits. Changing capitalism does not mean removing markets or destroying property, but rather reshaping production and consumption markets so economic value is not distorted by power divides between capital and other. How would you remake capitalism? I’ve written a lot about Marxian accounts of the crisis, in which wage stagnation from class dynamics leads to underconsumption and over-indebtedness. However, David Harvey takes a bit of a different tack in explaining capitalist crises in general in his book, The Enigma of Capital, from Oxford UP. Harvey is a self-labelled economic geographer. He studies the internal dynamics of capitalism, but also focuses on the extensive margin, how capital comes to imperialize the economic space (importantly, it does so by necessity). In the London Review of Books, Benjamin Kunkel does an excellent job unpacking a key model behind Harvey’s work, which is essentially straight out of Marx’s Capital. What unites the strands is the fundamental antagonism between capital and labour, with their opposing pursuits of profits and wages…[which] nevertheless prevents such a balance from being struck except occasionally and by accident, to be immediately upset by any advantage gained by labour or more likely by capital. Harvey doesn’t really present solutions in the book. He does point out the ecological ramifications of overaccumulation and expansion of capital on the extensive margin. I think Kunkel nails it, though, that Harvey’s brand of Marxism “seems better prepared to interpret the world than to change it.” The book is certainly a worthwhile read during a time of crisis, but one doesn’t read Harvey and begin to think of micro-solutions, like worker ownership of the means of production. Instead, I came away with a visceral understanding of the roots of capital’s globalization, and a great uncertainty over what to do about it. A few weeks ago, I finished reading Kim Bobo’s Wage Theft in America (published last year, but new to me). The title is self-explanatory, and the author is the founder of Interfaith Worker Justice, an organization that has advocated and organized tirelessly to ensure workers’ rights are fulfilled. The facts she presents in the book are stunning- depending on the low-wage industry, most employers have committed wage theft (around 60% in nursing homes, 100% of poultry plants). Total theft is measured in the billions. Wages are stolen in a variety of ways- simply paying below the minimum wage, forcing workers to work off the clock, not paying overtime, and others. Workers who have wages stolen are disproportionally female, minority, and immigrant. Those with the least power in society, and already limited means, have their hard-earned money taken from them. The employers, on the other hand, face weak penalties (they merely have to pay, with interest, the wages they’ve stolen), and enforcement is weak. Abstracting from these important details, Bobo’s book ulimately reads as an account of economic power and political economy. At the micro-level, employees who fear for there jobs are intimidated to not speak up about wage theft. Only when these workers are made aware of the laws by organizations like Bobo’s are these injustices addressed. At the macro-level, business has effectively neutered the Department of Labor, labor unions, and any political will to address these issues. Hilda Solis is certainly a vast improvement from Elaine Chao, but she’s no Frances Perkins, the New Deal Secretary whose strength and effectiveness Bobo extols. Why don’t we have a Frances Perkins, and a suitable budget in this area? The power of employer communities clearly matters here. This problem is one that should provoke immediate outrage, even (and I’d argue especially) among free-market proponents. This is a perfect example of cheating, a place where the government must step in to ensure that the at least the exchange of labor for money occurs fairly, lest the very foundations of capitalist labor exchange crumble. On this basis, it seems that Bobo is hoping to organize a movement, and use the labor consciousness of that movement to score further gains for labor. Employers, by lobbying through means like the chamber of commerce, and by imposing their will through managers in breakrooms, represent a real power. Effective organizing and education could theoretically build a movement to counteract that power, generate political will for stronger labor laws and enforcement, and ultimately lead to more just remuneration. This process takes time, but Bobo lays out the blueprint for what a revitalized Department of Labor would look like, and how we can organize to get there. If such a movement could score further victories for workers, like expanded union representation and more widespread living wages, even better. Wage theft, I’m sure Bobo hopes, could be a unifying issue to serve as the entry point for these other gains, all working inside the current capitalist system. Of course, if the root problem is employer power, the other alternative is to take the power directly from the employers and give it to the employees. Cooperatives like Mondragon are proliferating. Capitalist bankruptcies allow opportunities for worker expropriations, as seen in The Take. Rather than hoping for a series of band-aid wins, this approach would, workplace by workplace, ensure that employees would receive fair wages and then some, as they would make the decisions. This is much more difficult, because it entails bringing about an entirely new economic system, piece by piece. For more on what this looks like, see previous posts on cooperatives. Either way though, the symptom of wage theft is widespread, obvious, and morally flagrant. The root problem is employer power, and the solution is either to counteract the power, or take it away entirely. These movements can certainly be paired- more labor consciousness is needed if we hope to proliferate co-ops, and realization of concrete alternatives is necessary to generate political will for legislative and enforcement reform. The losses of labor after its New Deal gains should clearly demonstrate which solution is sustainable in the long term. A different type of labor and remuneration, though, is possible. Bobo’s effort to raise awareness of these basic power dynamics is a good start. In this video, Slavoj Zizek argues that a creating a more charitable capitalism is a path of folly. For some background on Zizek, check out this profile of him in Der Spiegel (I admit that I hadn’t heard of him until a month ago).